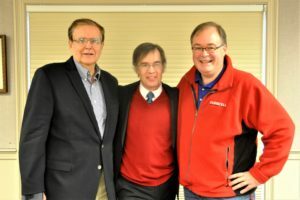 History in perspective: The presenters at the annual meeting of the Monroe History Society Saturday (Nov. 11) at the Edith Wheeler Memorial Library, left to right, John Babina, who profiled the Stevenson Dam and its Centennial, Hamish Lutris, who celebrated military veterans in U.S., history, and Kevin Daly, who was elected historian of the society and traced the origins of an 1898 map of Monroe hand-drawn by Samuel Hurd. Vic Casaretti was reelected president of the society (est. 1959) with an executive board of Vida Stone, vice-president, Deb Heim, treasurer, and Mary Kellogg, secretary. Also reelected as members of the board of directors were Nancy Zorena, Kathy Balleta, Karen Cardi, Cindy Robertson, Emily Serniak, Paul Lesko, Cynthia Giancaspro and Marven Moss.